El Dia de los Muertos (The Day of the Dead), a Mexican celebration, is a day to celebrate, remember, and prepare special foods in honor of those who have departed. On this day in Mexico the streets near the cemeteries are filled with decorations of papel picado , flowers, candy calaveras (skeletons and skulls), and parades. It is believed that the spirits of the dead visit their families on October 31 and leave on November 2. 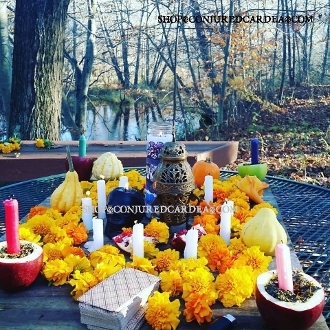 In order to celebrate, the families make altars and place ofrendas (offerings) of food such as pan de muertos baked in shapes of skulls and figures, candles, incense, yellow marigolds known as cempazuchitl (also spelled zempasuchil) and most importantly a photo of the departed soul is placed on the altar. Mexican culture reacts to death with mourning along with happiness and joy. They look at death with the same fear as any other culture, but there is a difference; they reflect their fear by mocking and living alongside death. Living alongside death means that Mexican culture has learned to accept it within their lives as death is apparent in everyday life. Death is laughed at in its face. Many euphemisms are used for death, La calaca (the skeleton), la pelona ("baldy"), la flaca ("skinny"), and la huesada ("bony"). There are sayings and poems that are popular with The day of the dead. These sayings are cliches and lose meaning when translated. For example "La muerte es flaca y no puede conmigo" means "Death is skinny/weak and she can't carry me." Calaveras (skulls) are decorated with bright colors with the name of the departed inscribed on the head. Children carrying yellow marigolds enjoy the processions to the cemetery. At the cemetery, music is played and dances are made to honor the spirits. This listing is for one candle, dressed and blessed in your name, to honor your ancestors, spirits and/or guides. May they bles you in the coming year. You will receive photos within 72 hours of the service.